After a seven-month battle against injury, The Dictator reigns in Doha with a record-equalling 27th ITTF World Tour title. Ma Long clinches victory at the Seamaster 2019 ITTF World Tour Platinum Qatar Open on Sunday. Cometh the hour. Cometh the man. Or should we say superman? Arguably the greatest player ever to grace the sport of table tennis, Ma Long completed his stunning return from a seven-month knee injury nightmare with silverware on Sunday. 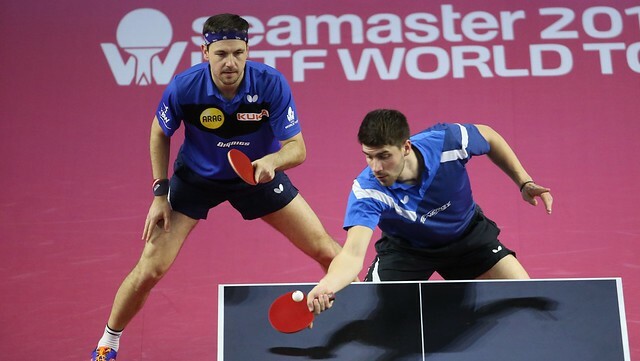 If that wasn’t remarkable enough, his victory at the Seamaster 2019 ITTF World Tour Platinum Qatar Open also saw the Chinese superstar rewrite the record books, equalling the 27 ITTF World Tour titles attained by Belarusian legend, Vladimir Samsonov. Furthermore, today’s victory in Doha comes exactly three weeks before the World Table Tennis Championships kick off in Budapest, the sport’s main event of the year which everyone had thought Ma Long would be missing. Doubts even surrounded his participation at the Tokyo 2020 Olympic Games. Not anymore. Ma Long is back in business, and how! Nicknamed ‘The Dictator’ and ‘The Dragon’ for his ruthless, natural-born winning ability, Ma Long showed that he has not lost an ounce of his champion class, quality and competitiveness. In Qatar, he truly was the ‘Comeback King’ and not only for returning from seven lonely months out in the wilderness. In the final itself, Ma Long had to haul himself back from two games down against fellow Chinese star and second seed, Lin Gaoyuan, who looked on course to ruin the Dictator’s dream return to the international stage. Give up hope, Ma Long certainly did not. The 30-year-old, reigning World and Olympic Champion called upon all of his big-match experience to stage an inspirational fightback, winning four consecutive games to complete a victory that meant so much. Following confidence-boosting 4-0 wins over Timo Boll (GER) and Jun Mizutani (JPN), the Dictator overcame his two highest-ranked compatriots, Xu Xin and Lin Gaoyuan, each by the 4-2 scoreline. Indeed, Ma Long’s story in Qatar has been about raising the intensity when it matters most, a characteristic of all true champions. His final flourish provided a fitting ending to proceedings in Doha and the perfect launchpad for preparations ahead of the World Championships, which will take place between 21-28 April in Budapest. The Women’s Singles final was a repeat of last year’s match-up, as Wang Manyu once again went head to head with Liu Shiwen; only this time there would be a role reversal in terms of result. Coming into the contest off the back of an imperious 4-0 victory over top seed and World no. 1, Ding Ning, in Sunday morning’s semi-final, Wang Manyu cut the figure of a woman on a serious mission here in Doha. The Mixed Doubles final was a stunning show of free-flowing table tennis. Liu Shiwen and Xu Xin (CHN) rose highest to the occasion, seeing off Mima Ito and Masataka Morizono (JPN) in three straight games to clinch gold. The Men’s Doubles final was a hard-fought affair. Timo Boll and Patrick Franziska (GER) made it tough for Ho Kwan Kit and Wong Chun Ting (HKG), levelling the scores at 1-1, but the experienced pair then pushed on to win 3-1 and bring the gold medals to Hong Kong. An all-Chinese showdown in the Women’s Doubles final saw Ding Ning and Wang Yidi take the match to a fifth game, but Sun Yingsha and Wang Manyu managed to get over the line and leave the court as champions. Naturally, all beaten finalists played key roles in the dramatic narrative to unfold in Doha over the past six days. Lin Gaoyuan came ever so close to adding to his ITTF World Tour Hungarian Open title earlier this year, the ‘Dark Knight’ edging arguably the most epic match of this year’s Qatar Open: Saturday night’s marathon semi-final against Mattias Falck (SWE), which finished 4-3. Falck’s breath-taking, battling performances provided Europe’s brightest light, not least after the 12thseed defeated last year’s ITTF World Tour Grand Finals champion, Tomokazu Harimoto (JPN) in the quarter-finals. In the women’s draw, Liu Shiwen played comfortably her best table tennis in nearly a year to reach the final, while beaten semi-finalist, Sun Yingsha (CHN) leaves Qatar with plenty more credit added to her burgeoning reputation following her selection for the World Championships off the back of stunning displays at the Chinese ‘Marvellous 12’ qualification tournament. The biggest event in the international table tennis calendar will kick off in three weeks’ time, as the world’s greatest stars gather in the Hungarian capital to battle for the sport’s major prizes. Until then, stay up to date on all news and build-up on ITTF.com and the ITTF’s social media channels: Facebook, Instagram, Twitter, Weibo, Youtube, LinkedIn.